Uttaratantra Shastra (Skt. Mahāyānottaratantra Śāstra; Tib. ཐེག་པ་ཆེན་པོ་རྒྱུད་བླ་མའི་བསྟན་བཆོས་, Gyü Lama, Wyl. theg pa chen po rgyud bla ma'i bstan bcos; Trad. Chin. 分別寶性大乘無上續論), Treatise on the Sublime Continuum or the Ratnagotravibhaga. One of the Five Treatises of Maitreya, a commentary on the teachings of the third turning of the wheel of Dharma explaining buddha nature. It was first translated into Tibetan by Ngok Loden Sherab and the Kashmiri pandita Sajjana. 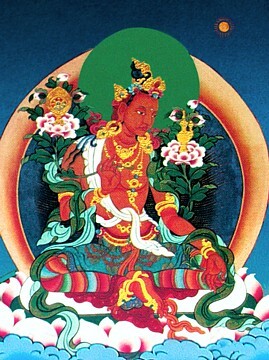 It is included among the so-called "Thirteen great texts", which form the core of the curriculum in most shedras and on which Khenpo Shenga provided commentaries. The only refuge is the Buddha. And is thus the culmination of the sangha. There is no joy among the five classes of beings. Is held to be an afflictive obscuration. Is held to be a cognitive obscuration. Beings always have the buddha nature. Which are characterized by their total separateness. Which have the character of total inseparability. Buddha-Nature, Mahayana Uttaratantra Shastra by Arya Maitreya with commentary by Dzongsar Jamyang Khyentse Rinpoche, edited by Alex Trisoglio, Khyentse Foundation, 2007. A free copy can be requested online at siddharthasintent.org. Traité de la Continuité ultime du Grand Véhicule de Maitreya, avec le commentaire de Jamgœun Kongtrul Rimpoché, L'Inéluctable Rugissement du lion (trad. Etienne Loyon); including commentary by Khenpo Tsultrim Gyamtso Rinpoche. All accessible on line here! J. Takasaki, A Study of the Ratnagotravibhaga, Rome, Is. M.E.O., 1966. ↑ This quote is often paraphrased in two lines, e.g. This page was last edited on 27 September 2017, at 04:27.